Previously [MHG98,MHJG00], we reported our efforts to verify the producer/consumer transaction ordering property for the PCI 2.1 protocol extended with local master IDs. Although our efforts were met with some success, we were unable to show that all execution traces of all acyclic PCI networks satisfy this transaction ordering property. In this paper, we present a veri.cation technique based on network symmetry classes along with a manually derived abstraction that allows us to show, at the bus/bridge level, that all execution traces of all acyclic PCI networks satisfy the transaction ordering property. 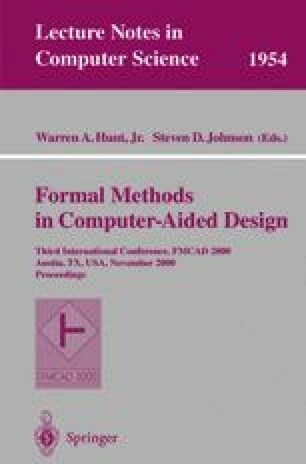 This now completed case study (modulo the validity of the axioms used to characterized the abstraction) suggests several avenues for further work in combining model-checking (algorithmic methods) and theorem-proving (deductive methods) in judicious ways to solve infinite-state verification problems at the bus/interconnect level. It is a concrete illustration of partitioning concerns where designers can specify bus protocols in an operational semantics (rule-based) style, invent abstractions, and carry out finite-state model-checking while verification experts can establish formal properties of the abstraction. Francisco Corella. Proposal to fix ordering problem in PCI 2.1, 1996. Accessed April 2000. http://www.pcisig.com/reflector/thrd8.html#00706. Michael Jones. PCI transaction ordering case study. http://www.cs.utah.edu/~mjones/pci-pvs.html, 2000.